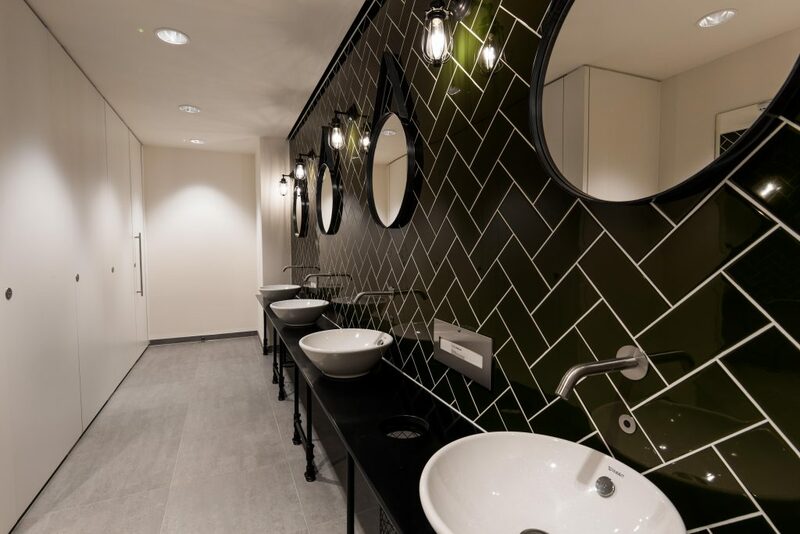 We created distinctive new washrooms on four levels as well as the new staff shower and changing area in the basement of International House on London’s dockside. International House is part of the St Katherine’s dock estate next to Tower Bridge – central London’s only marina. The building has been completely refurbished to offer exceptional retail and CAT A flexible office space over six floors. A stunning new entrance hall, floating hub and roof terrace have been created to make the most of its unique dockside location and its warehouse style office space with exposed brickwork and services is the perfect home for creative and tech companies. Working closely with Collins Construction and John Robertson Architects, we created the distinctive new washrooms on levels one, two, five and six as well as the new staff shower and changing area in the basement. With dark green metro tiles in a herringbone pattern with contrasting grouting, plus unique feature mirrors, pendant lighting and bespoke vanity units, the washrooms complement the heritage and industrial chic style of International House. We manufactured and installed the vanity units which comprise a Corian worktop plus individual countertop basins all set on a custom-made black metal frame. The vanities were designed with inset waste bins and wall mounted taps to complete the sleek, clutter-free look. Our full height Alto toilet cubicles were manufactured with a high pressure laminate finish in white, which together with its black high pressure laminate Concerto integrated duct panel system behind the WCs and urinals, creates a contemporary monochrome effect. The cubicles feature a unique flush front fascia which creates a smooth, virtually seamless façade and provides an unrivalled design statement for areas where luxury and uncompromising style are essential. The industrial-influenced design theme continues into the staff shower and changing areas in the basement which also feature a monochrome colour scheme. 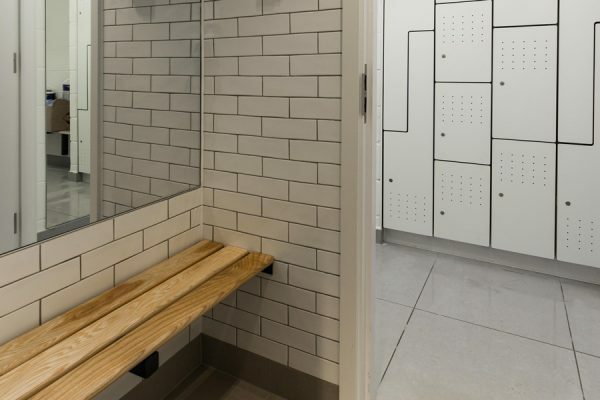 Here we installed our Forza lockers in a range of different shapes and sizes, with the majority large enough to comfortably accommodate a suit. 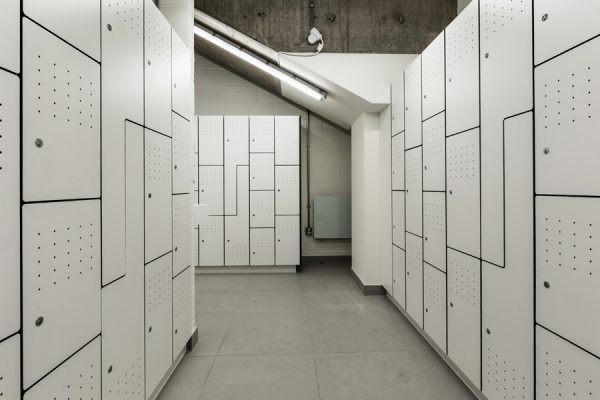 Manufactured in plain white solid grade laminate for durability, the lockers were finished with visible ventilation holes to tie in with the rest of the building’s interior. Our wooden bespoke legato bench units complete the changing area.